Spoiler alert: This post contains secrets. More specifically, bread baking secrets. As some of you already know, for many months now I’ve been making all my own bread at home from scratch. I’ve posted recipe after recipe after recipe for bread on this here blog, but I’ve never really posted an all-purpose beginner’s guide to baking bread. Granted, I’m still far from being a pro at this, but I have picked up many tricks over the months, and now I want to share those tricks with you. The fact is, if you’re just looking to bake just some good bread, rather than amazing bread, then baking bread is super easy, and fairly hard to screw up. Yes, you’ll have plenty of little mishaps along the way, but rarely will any of those mishaps make your end product wholly inedible. So here they are: all my essential tips and tricks to baking good, everyday sandwich or snacking bread at home! To begin things, here are five basic yet absolutely essential tips that every home baker should know. Between kneading, rising, shaping, proofing, and baking, even your most basic bread will take you at least three hours, so I like to make sure I have at least four hours in my schedule whenever I’m baking bread. These won’t be four hours of active time, but they should be four hours where you’ll more or less be at home and by your kitchen. This is a simple trick that I’ve heard several pros recommend. 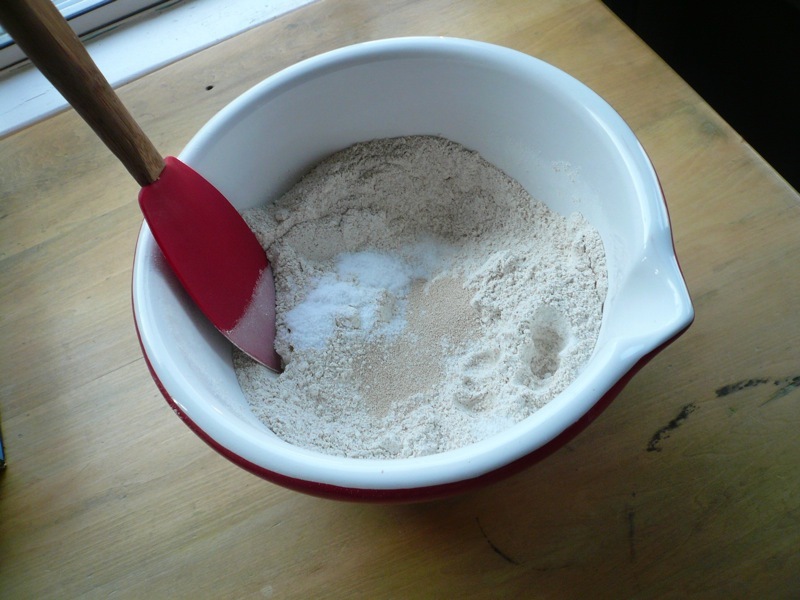 Instant (or rapid-rise) yeast, unlike regular yeast, does not need to be proofed (that is, mixed with water) beforehand; rather, you just add it directly to the flour at the beginning, saving you time and effort. 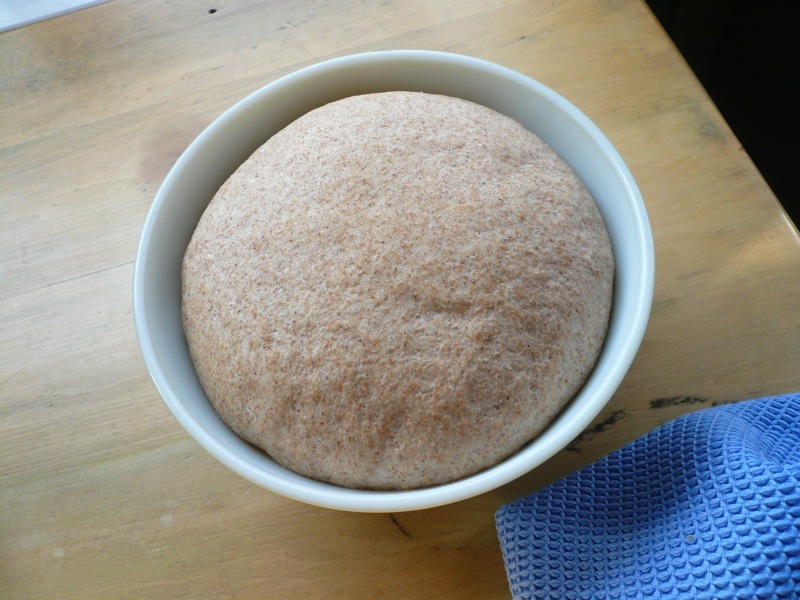 Plus, since instant yeast is essentially just more potent yeast, it only helps your breads rise better. …at least if you’re kneading by hand. This is not exactly true, but if you’re a novice baker, you’re in much greater risk of not kneading enough. Seriously, to overknead by hand would require you to be kneading for over 10, probably 15 minutes, and your hands are going to get tired long before that. The real key in successfully baking bread at home is being attentive to how your dough is performing and reacting appropriately. Even beyond ingredient measurements, there are so many factors that will affect your dough—temperature, humidity, brand of flour, freshness of yeast, and so on—and because of this, you need to feel comfortable veering away from any recipe when things don’t look quite right. Basically, this means adding more flour when the dough is looking too wet and adding more water when the dough is looking to dry. 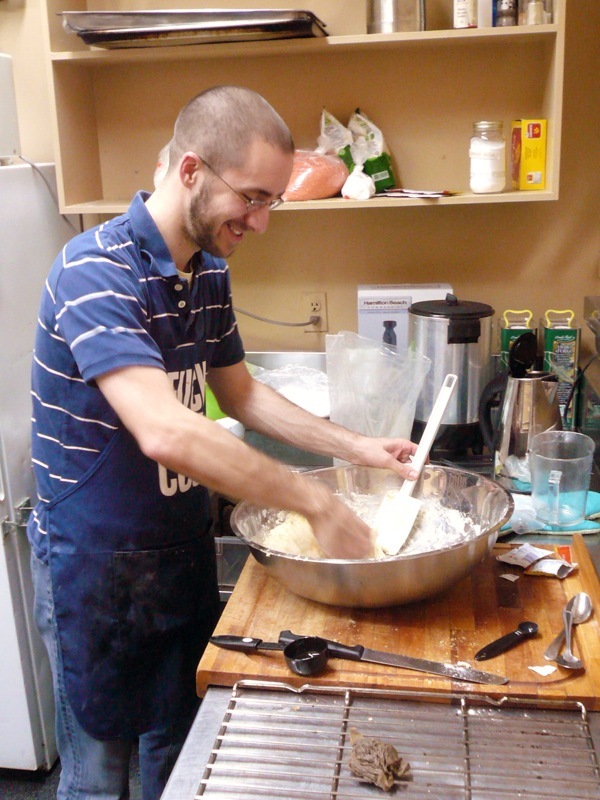 With practice, you’ll soon develop a sense of when a dough just feels right. 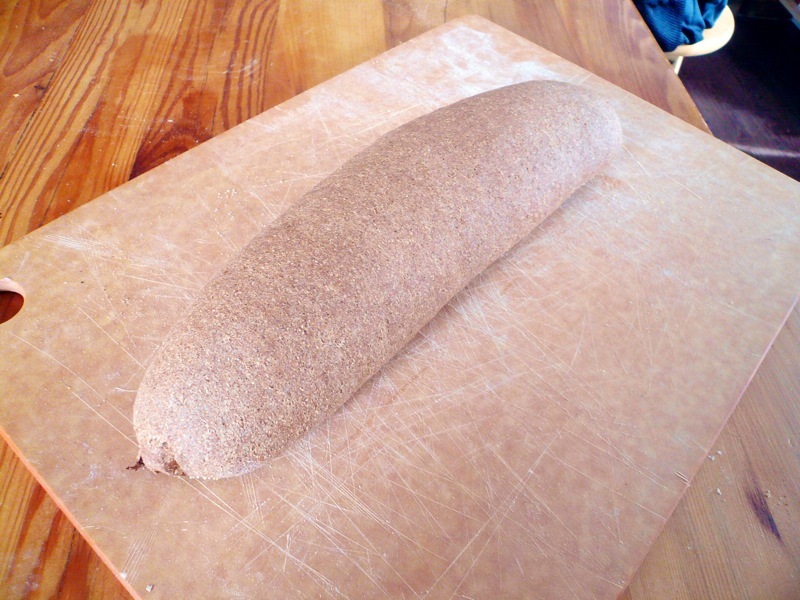 One of the simplest mistakes novice bakers will make is not allowing a freshly baked loaf sufficient time to cool. A lot of internal baking will continue during cooling, and cutting your bread too early will disrupt that process and potentially result in a partially unbaked loaf. I usually give my bread about an hour; this will give it enough time to cool, but still leave it a bit warm for that delectable first bite. Now that you’ve got the basic tricks down, we’re ready to start making some bread! Essentially, bread is just three things: flour, yeast, and water. To this you will sometimes add salt (for flavour), oil (for texture), and sugar (for flavour, and to react with the yeast). In this recipe, I will just be using flour, yeast, water, and salt. This recipe is still tasty and satisfying, though not perhaps extraordinary. 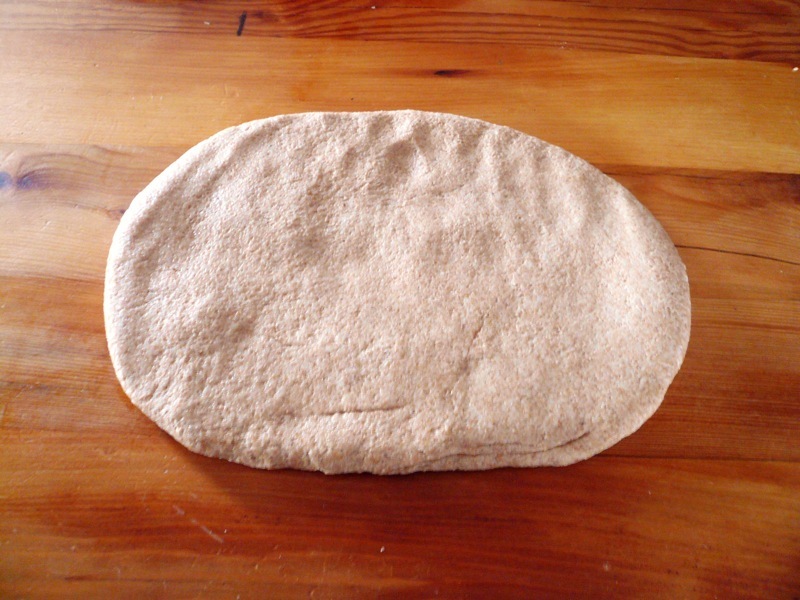 However, from this basic recipe you’ll be able to go off and make all sorts of other breads by adding toppings, trying different flours, and so on. Anyway, without further ado, here we go! Start with 3.5 cups of flour, 2 tsp of yeast, and 1 tsp salt. 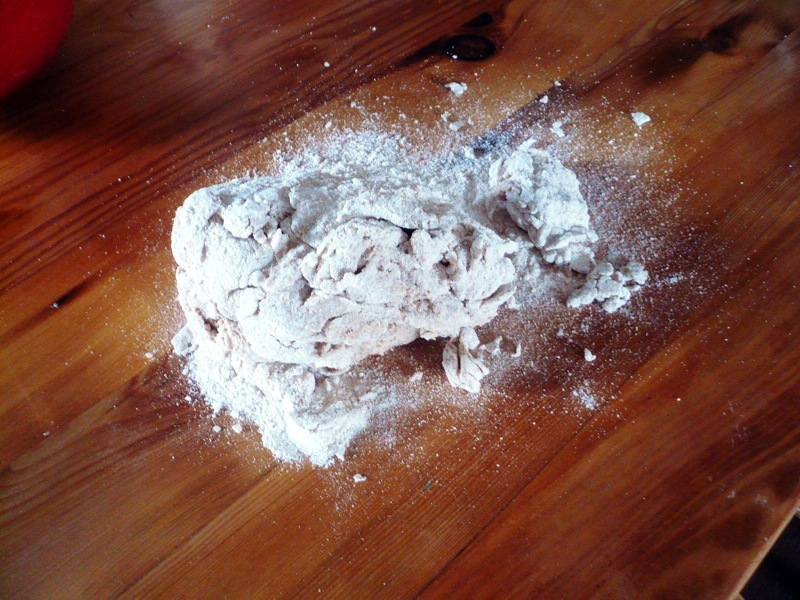 (You will probably need more flour as you’re kneading.) As for choice of flour, it’s up to you. 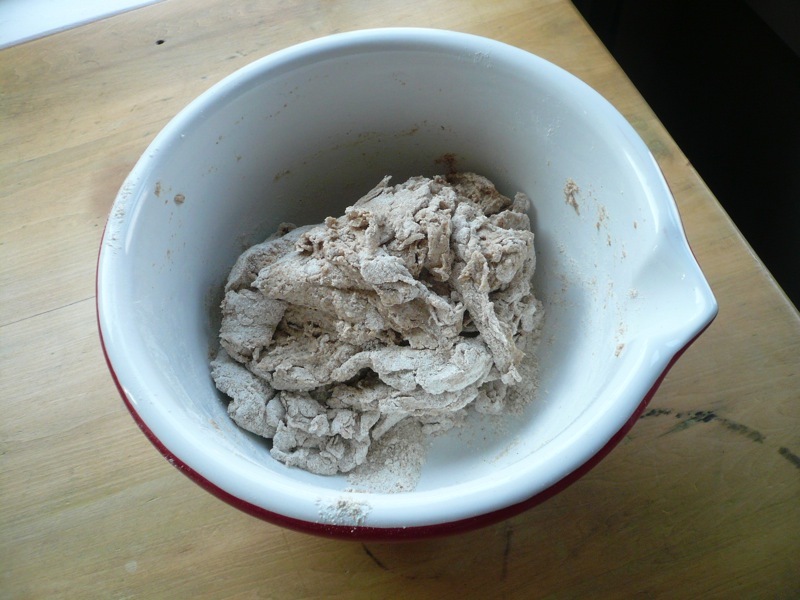 However, some tips: If you want to make white bread, try to procure some bread flour, which has a higher gluten content and will form a much better dough. 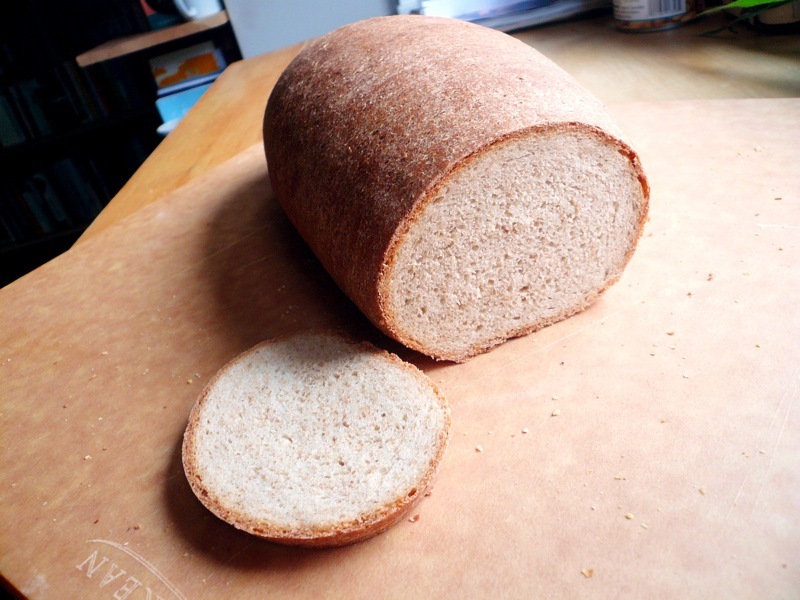 If you want to make wheat bread and are using normal whole wheat flour, you will probably want to use 50% whole wheat flour and 50% white or bread flour; normal wheat flour doesn’t usually work quite right. 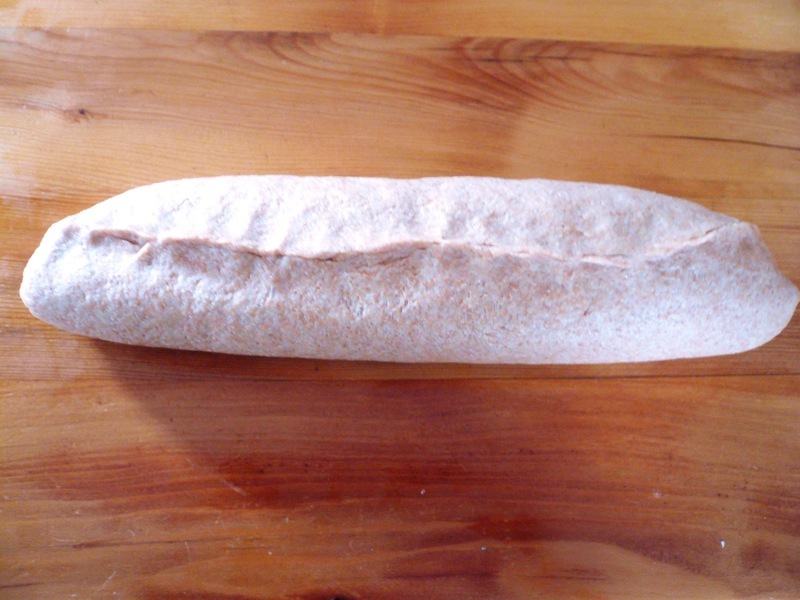 If you want to make wheat bread and are lucky enough to live in Ontario, try to procure some Red Fife flour, which can be used solely, without adding any white flour, and is naturally delicious to boot. 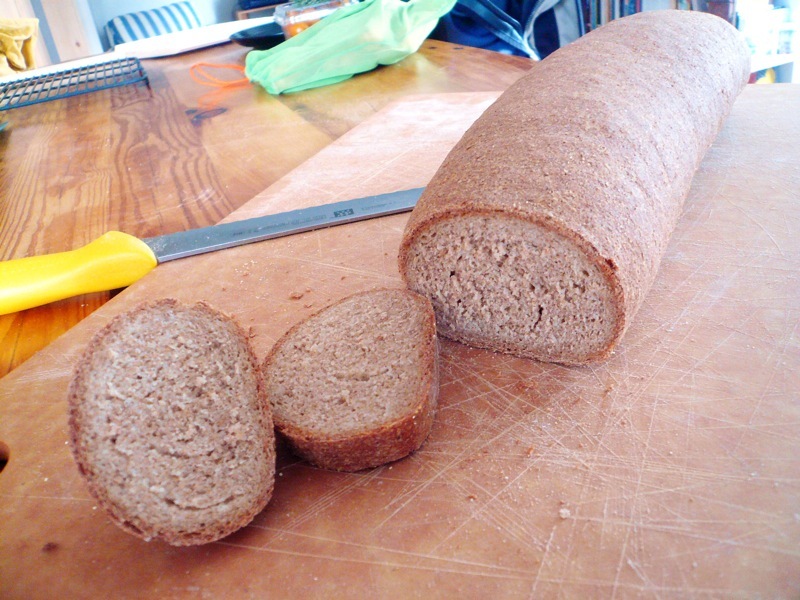 And if you want to make a spelt bread, I’ve had luck using spelt flour alone. You’ll want about 1.25 cups of lukewarm water. Throw this right into your flour mixture. In the bowl, mix everything together with a rubber spatula or some such utensil. The goal here is not to get everything to come together but just to form a ball-ish mass with the majority of what you have, as pictured above. Kneading, in simplest terms, is pressing your dough together—that is, more like working out a knot on someone’s back than giving someone a backrub. You really want to put all your arm muscle into this, and to do so for a while, at least 5 minutes, but likely closer to 10. 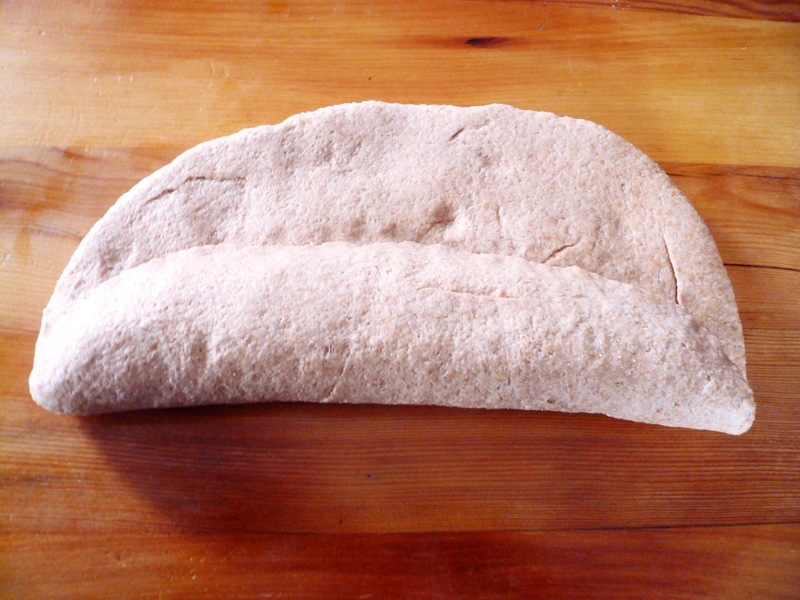 A basic kneading procedure is to fold your lump of dough in half, press it in good, turn the lump 90 degrees, and then repeat the fold, press, turn sequence. As you go, continually incorporate those remaining bits of flour left over from the bowl, kneading your dough into them and pressing them in. 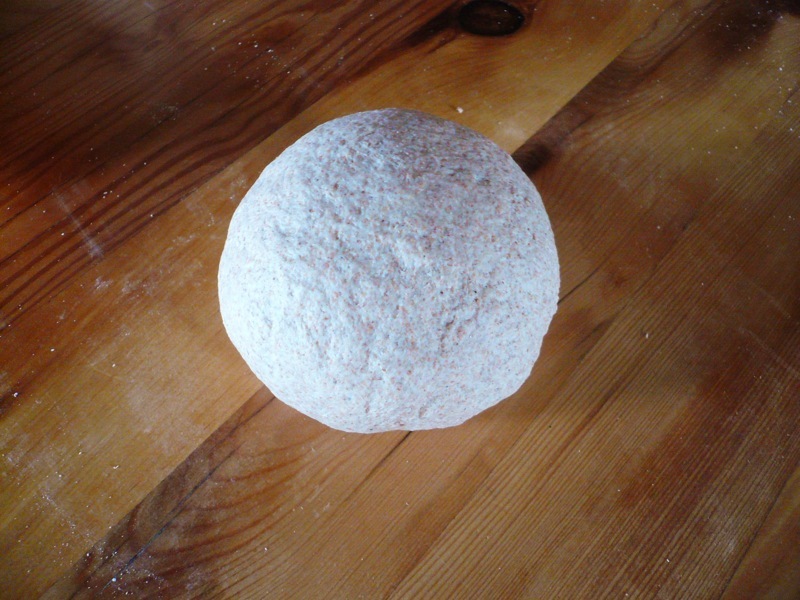 The picture above shows a ball of dough about midway through the kneading process. Like I said above, kneading requires you to be responsive. As you knead, you’ll notice your dough changing feel. In the end, your dough should be tacky but not sticky. If it’s looking too sticky (if clumps of dough are continually sticking to your palms as you knead), throw a handful of flour on top and knead that in, repeating if necessary. If it’s feeling too dry, wet your hands and knead for a bit, repeating if necessary. Definitely be more cautious when adding water than flour, as doughs are much more sensitive to additions in water content. 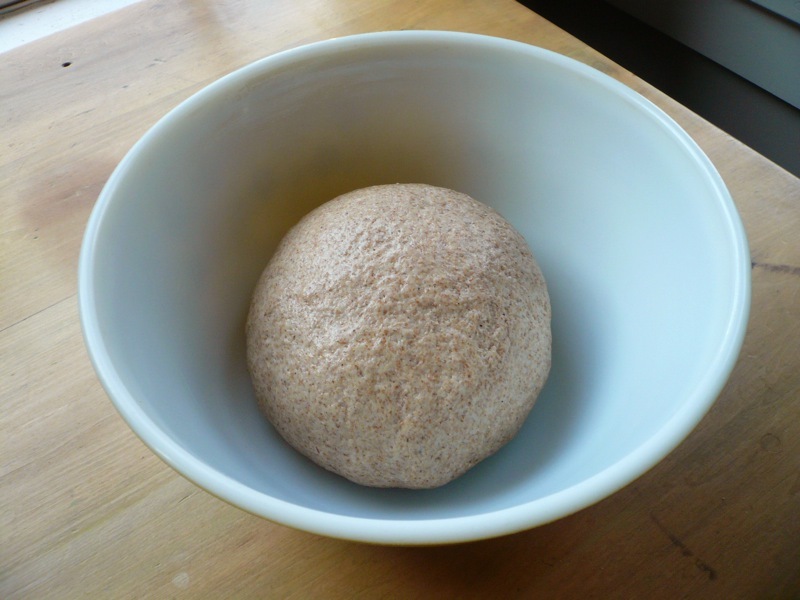 Once your dough looks something like the dough pictured above, you’re done! Now you’re ready to take a break and let yeast do its magic. In preparation for your first rise, lightly oil a big bowl. What oil you use doesn’t really matter, but you should use a different bowl than the one you used for mixing, since you want the bowl to be clean and dry. Once your bowl is oiled, toss your ball of dough around in the bowl, getting oil on every part of its surface. Now simply put a towel on top of that bowl and walk away. For about two hours. After about two hours, your dough should’ve about doubled in size. Sometimes it’ll double in less time, sometimes it’ll take more, but two hours is generally a good benchmark. Now you’re ready to shape your dough and give it its second rise. The first thing you want to do now is punch—literally punch—your dough down. Just slam your first straight down into your big risen dough. (For you keeners out there, punching your dough down gets the gas out, making for a dense loaf in the end; if you want an airier bread, you actually want to skip punching down and avoid handling your dough as much as you can in this step.) 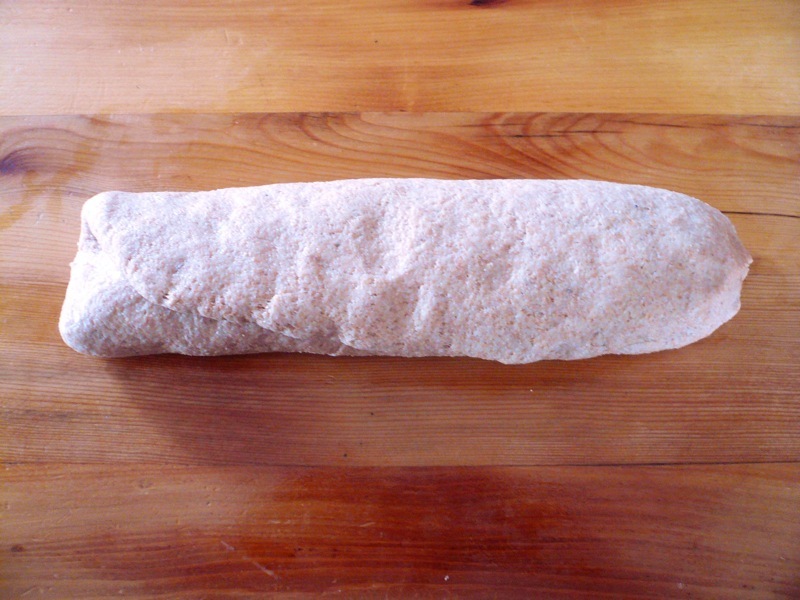 Next, dump your collapsed dough onto the counter and pat it down into a flat oblong rectangle, as pictured above. And believe it, that’s all there is to it! You’re already done. Now your dough must go through its second rise, or what’s called proofing. The good news is that the second rise is much shorter than the first: I usually give my doughs about 45 minutes. If you’ve got a baking stone and peel, you’ll want to proof your dough on the peel; if you’ll be baking on a normal baking sheet, line the baking sheet with parchment paper and proof on that. 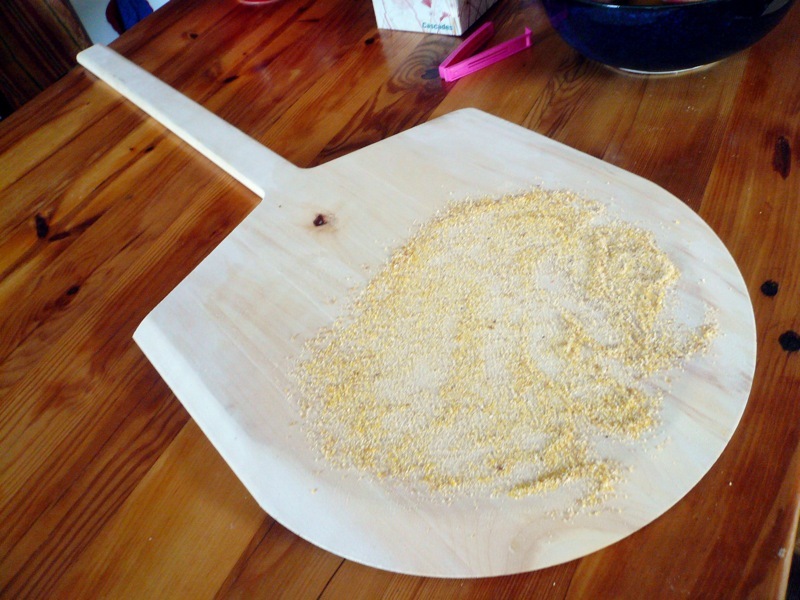 In either case, spread a small amount of fine cornmeal or semolina flour below your dough. 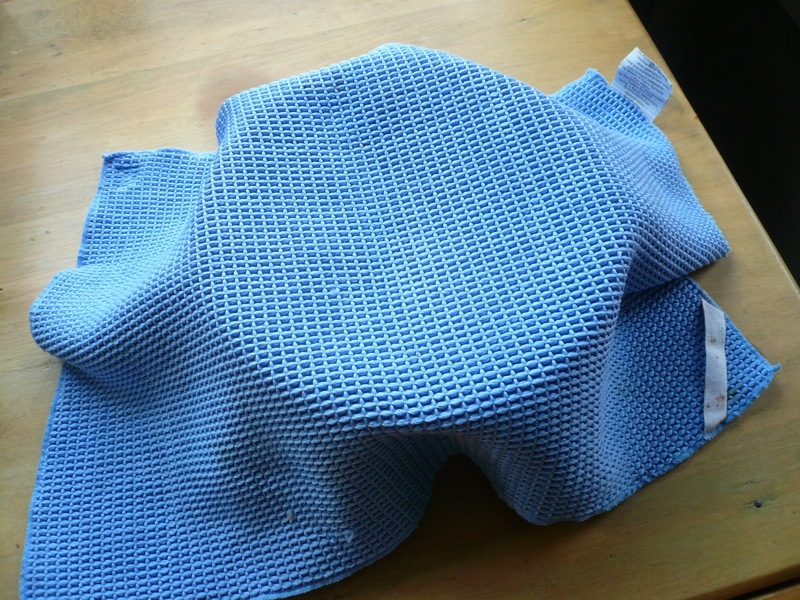 Cover with a towel and let rise. Now’s also a good time to preheat your oven! Set it to 425 F. If you’ve got a baking stone, making sure you’re preheating that at the same time. 13. Come back, again—and bake! After 45 minutes or so, your dough should’ve grown a bit; it needn’t, and probably shouldn’t be a full doubling this time. You’re now ready to bake! Before putting your dough in the oven, you may want to score, or slash, it. I usually don’t, but that’s because I haven’t found it necessary with the breads I’ve been making. If you wish to do so (it can often assist with the baking process), simply lightly run a serrated bread knife diagonally or laterally across the width of your dough; two or three slashes is good. Now put your dough in the oven, either directly by moving the baking sheet it was proofing on, or by shaking it from your peel to your baking stone. Bake for 5 minutes at 425 F, and then lower the oven heat to 375 F and bake for another 35 minutes. After 40 minutes of baking, your bread should be done. There are numerous pieces of wisdom I’ve been told for how to know when a loaf is baked, but anything short of an internal thermometer is not much more than an old wives’ tale, and I’ve just never really understood what it means for a loaf to “sound hollow” when you tap it and besides the loaf is like 400 degrees why do you want to touch that. 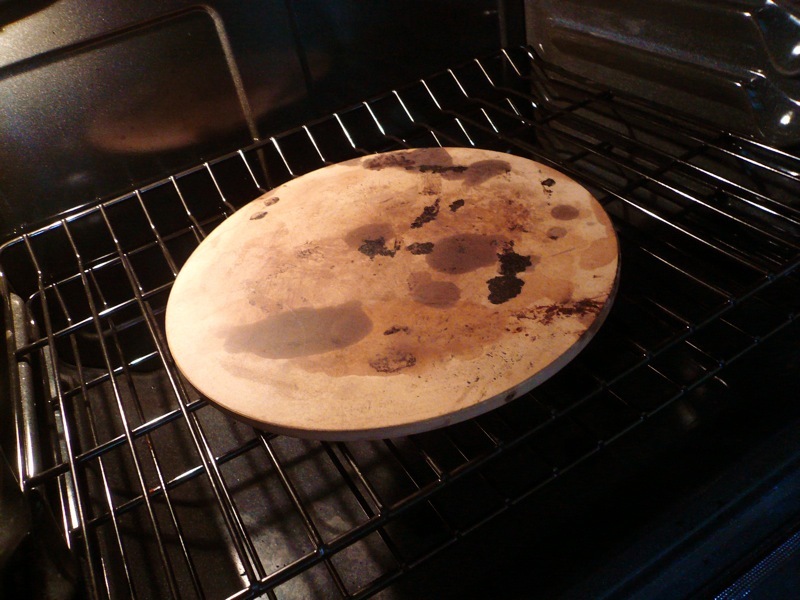 Anyway, 40 minutes should be about good, though you could go a little longer if you want a darker crust. 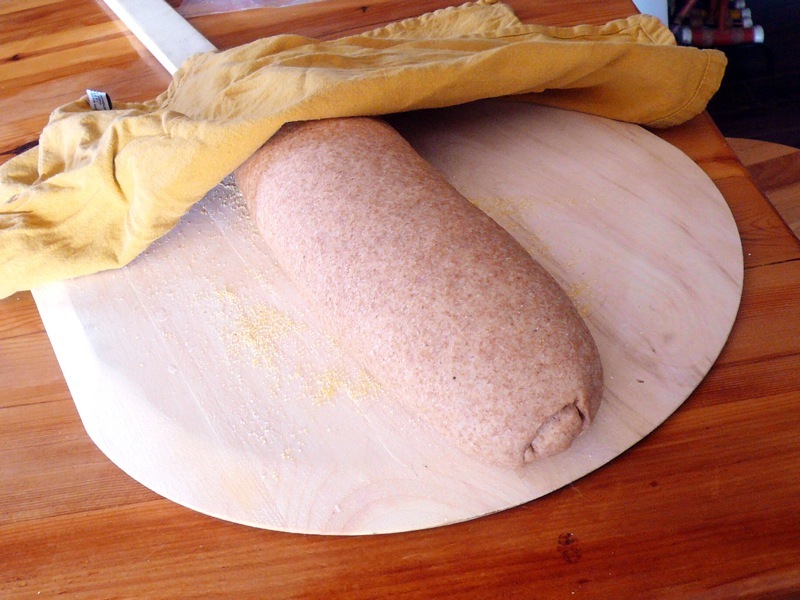 Let your bread cool on a cooling rack (not as pictured) for about an hour. As I said above, it really is essential that you let your bread fully cool, as a lot of internal baking still goes on after it comes out of the oven. After your loaf is cooled, you’re finally ready to slice it up, chow down, and enjoy! Congratulations! As a short coda to this horribly long post, I wanted to leave you with three simple additions you can make to your kitchen if you’re looking to step up your bread baking production. You can still make totally delicious bread without these additions, as I indeed did for years, but now that I have them, I can really see what a world of difference they make. I didn’t have one of these for years, but even for casual bread baking it makes things so much simpler. All dough formulas are actually calculated by weight, not volume, and with the varying densities and varieties of flour, measuring things out by cups is never a sure-fire way to go. 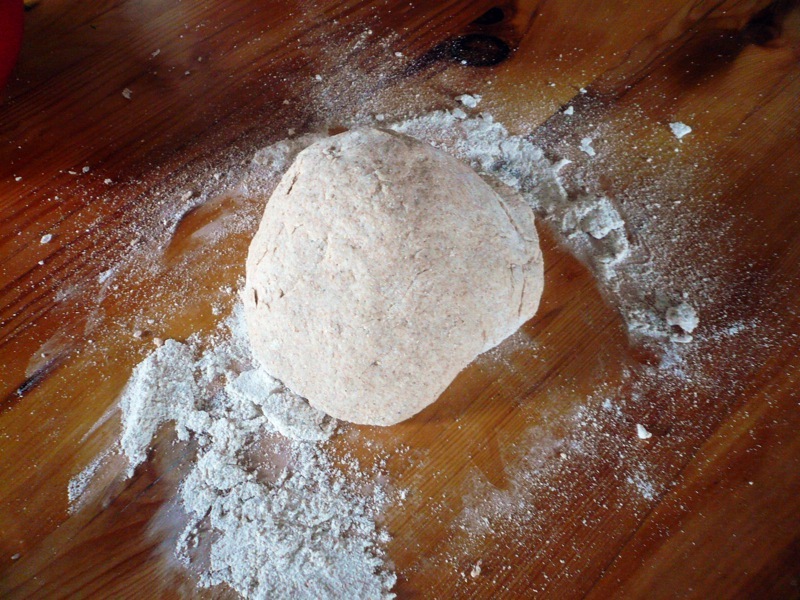 All this means is that you’ll need to do some fiddling while kneading, adding a little flour or water when necessary. 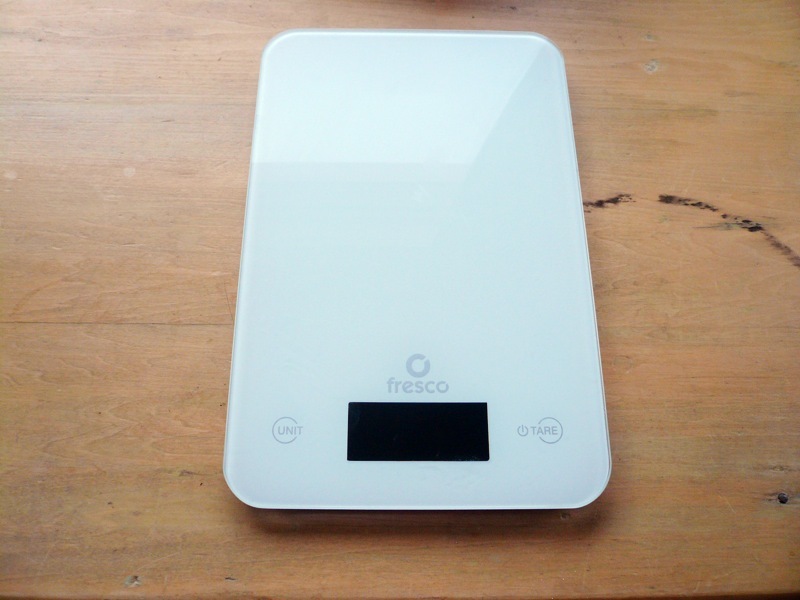 A basic kitchen scale alleviates this need, and lets you reliably mix up perfect doughs again and again. If you have a kitchen scale, I’ll let you know that my magic by-weight bread formula is: 500 g flour, 2 tsp yeast, and 1 tsp salt for the dry ingredients, and 50 g wildflower honey with 250 g of water for the wet. Comes out perfect every time. Baking stones really do make your breads bake better, providing hotter and more consistent heat to your bread throughout the baking process. 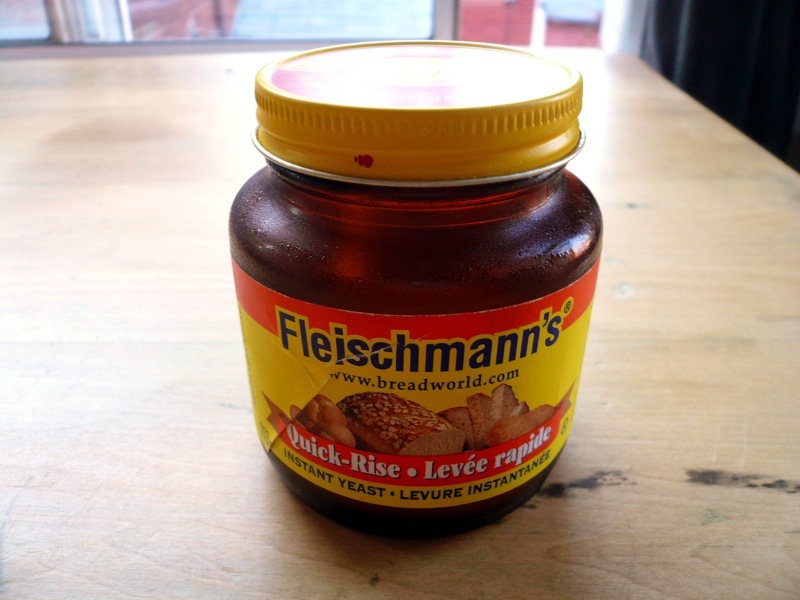 It’s a simple, albeit heavy, purchase, but it’ll really step up the quality of your loaves. Plus, you can make pizzas on it too! Actually, this is just an addendum to the last tip, because if you’re going to use a baking stone, you should really be using a baking peel as well. 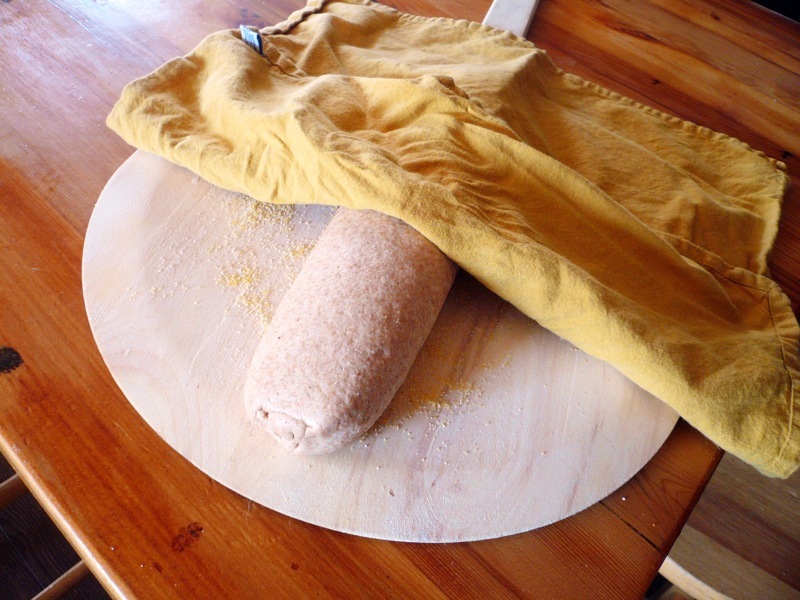 It’s simply the best way to transfer your dough to the stone; any other method will disrupt the dough too much. Plus, you can transfer pizzas with it too! And that’s all for today, folks. Sorry that it took me three months from my last post to write this—but if you’ve read down this far, you probably can understand why. 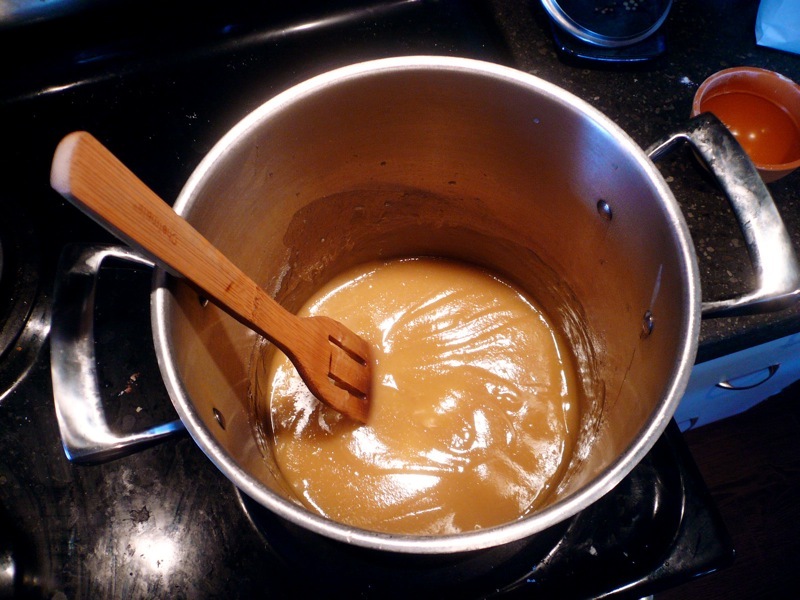 Now if you know anything about cajun cooking—or French cooking, for that matter—you probably know that a roux is a soup base made by browning flour in butter. Just about every cajun dish you’ve probably heard of, from gumbo to jambalaya to étouffée, starts with a roux. But in addition to using a roux as a base for other soups, you can also turn it into a roux soup—a thick, hearty, stew bursting with the taste of roux. It may not sound or look like much, but this simple dish is immensely flavourful and delicious—and all that flavour really just comes from the roux! No fancy spices or anything are needed. 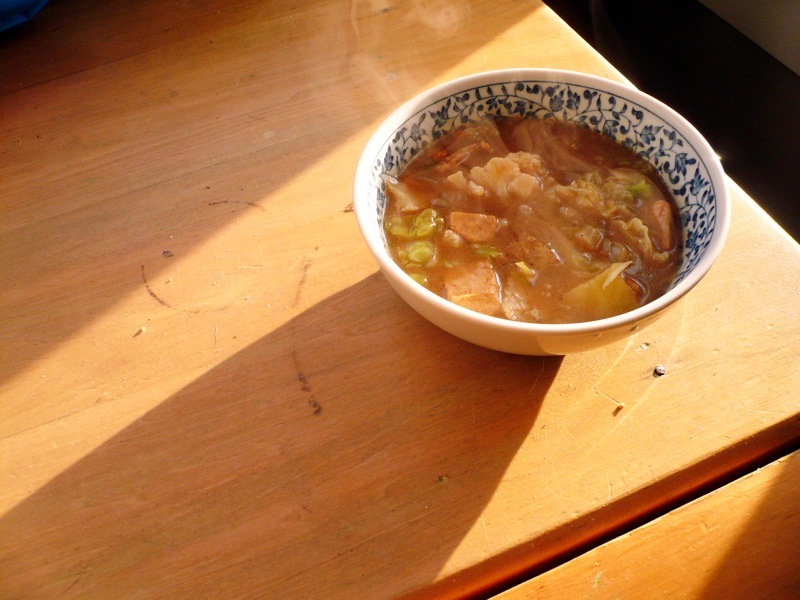 In addition, this soup is very flexible with its ingredients, and can be made year-round, no matter what’s in season. There’re really no rules for what veg is right for a roux, but I’ve found that starchy, white vegetables work best: potatoes for sure, and cauliflower too. Just stay away from things like tomatoes that would excessively bleed into the soup. Prep all your vegetables ahead of time: Once you start the roux, you’re not going to have any free hands to chop vegetables until pretty much everything’s in there, so make sure to chop all your vegetables chopped appropriately at the very start. Brown some onions and mushrooms and whatever else: Once your roux is ready, add in your finely chopped onions, mushrooms, carrots and/or peppers. Stir all these into the roux, getting everything coated, and then let cook for 5 to 10 minutes until browned, stirring occasionally. Add your veg: Throw in your main soup vegetables (in this case, potatoes and cauliflower) and enough water to cover them. 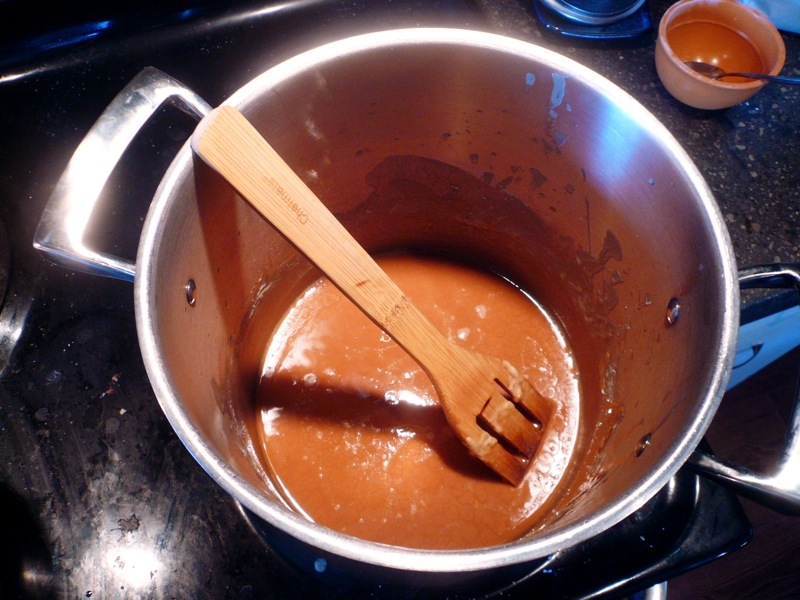 Stir in the water, breaking up the roux, bring the soup to a boil, and then simmer until vegetables are cooked. Correct for consistency throughout this process, adding more water if things are looking too thick, letting simmer if things are looking too thin. 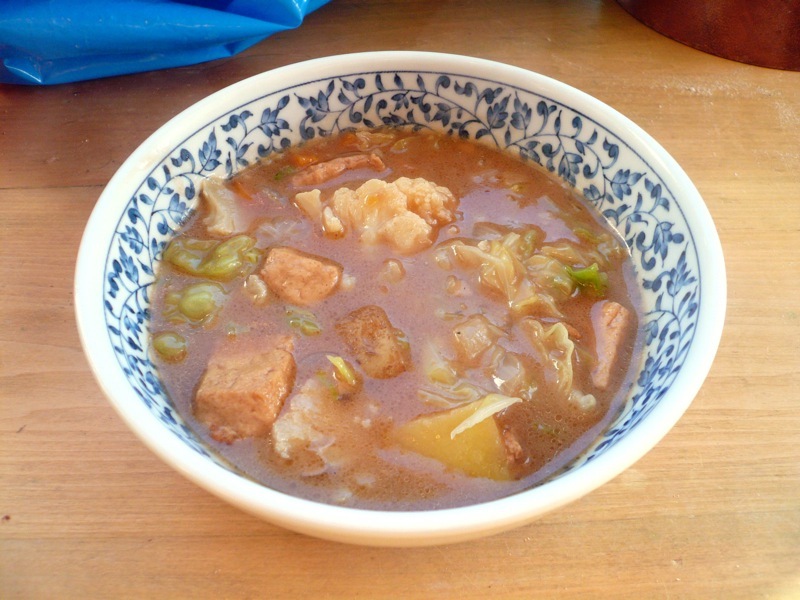 Add final touches: Add in any vegetables that only need to be lightly cooked, like cabbage, and the tofu, if using. Season generously with salt and pepper to taste and serve! 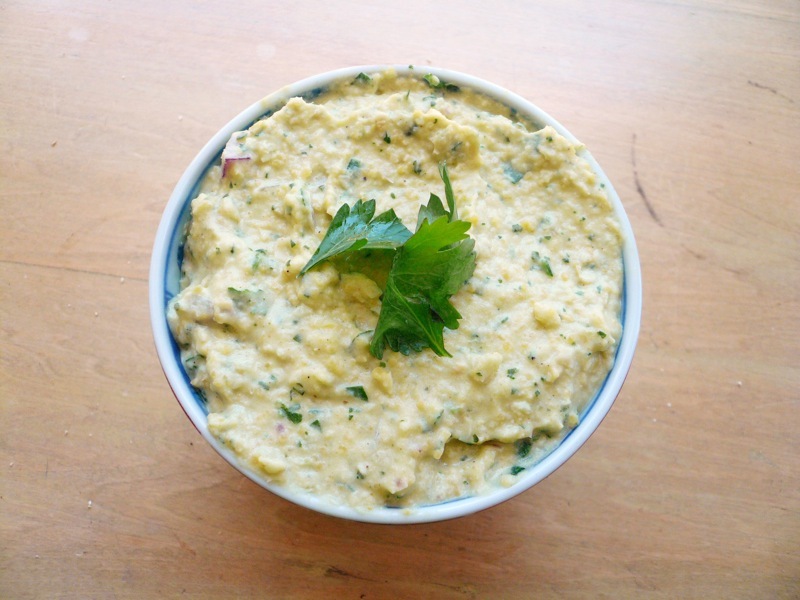 Falafel-flavoured hummus! Okay, I can’t be 100% certain that this has never appeared on the internet before, but my various efforts at Googling (and even Binging for god’s sake (I was getting paranoid)) “falafel hummus”, though turning up many hits, only loaded pages featuring falafel with hummus and the like. 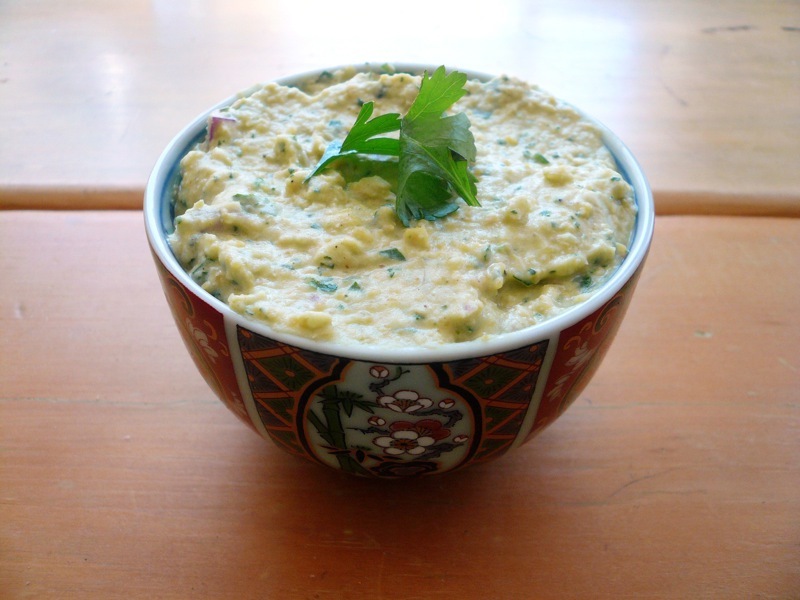 As far as I can tell, no one on the internet has yet thought to create and share a falafel-flavoured hummus recipe. Which is ridiculous, first of all, because falafel and hummus are both totally delicious, and two delicious things in one is always a good idea; second of all, because falafel and hummus even come from the same cuisine, which makes my immediately preceding claim a little less ridiculous; and third and most importantly, because falafel is pretty much hummus already, really just a mere tahini scoop and olive oil splash away. A bit of backstory: I got the idea for falafel hummus last week while I trying out Oh She Glows’ recent falafel recipe. That didn’t turn out so well, unfortunately (just a problem with getting the mixture to cohere, which was my fault, something with my breadcrumbs I think), but it did make me remark on how similar making falafel is to making hummus, at least at the start before you get to frying. Both dishes start from a chickpea base; falafel is just distinguished by a few extra ingredients (cilantro, parsley, and onion) and a drier texture (more crumbly than smooth). Thus I got to thinking: I could probably make a delicious and unique hummus using the very same falafel recipe I was working with, just by making a few slight modifications: namely, by removing the binders (breadcrumbs and ground flax seeds), including some hummus standards (tahini, olive oil, and water), and adding those extra falafel flavours. And I was right. The result was easily one of the best hummuses I’ve ever made, and one I’m sure I’ll be repeating it again very soon. The recipe follows the amounts from Oh She Glows’ falafel recipe very closely, so thanks again to Angela for the inspiration. 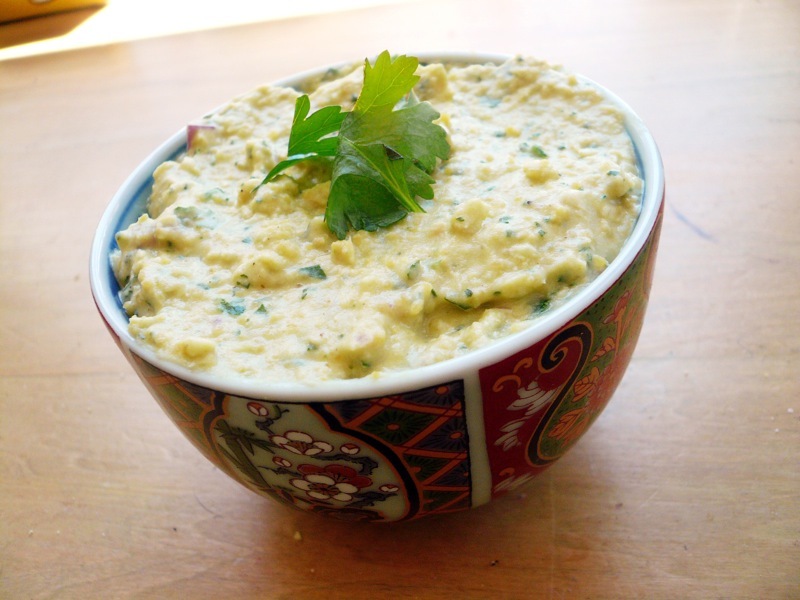 And be sure to refer to my classic hummus guide if you need some basic hummus-making pointers. Enjoy! Place all ingredients except the other half of your red onion (if using) in a food processor, and whip everything together. You may not want to add in all the olive oil and reserved chickpea liquid/water from the very start; instead, add it in gradually as you pulse. If the mixture is still looking too thick after all the liquids have been added, add more reserved chickpea liquid/water a little at a time until you reach your desired consistency. Garnish with parsley if you’re being fancy, or not if you’re being lazy. And that’s all there is to it! Thanks for joining me for this little milestone of internet culinary history. Now go off and make some falafel hummus for yourself and spread the word! They should: they’re my Half-Moon Spectaculars, the gluten-free sandwich creme cookies I’ve been raving about since the fall. 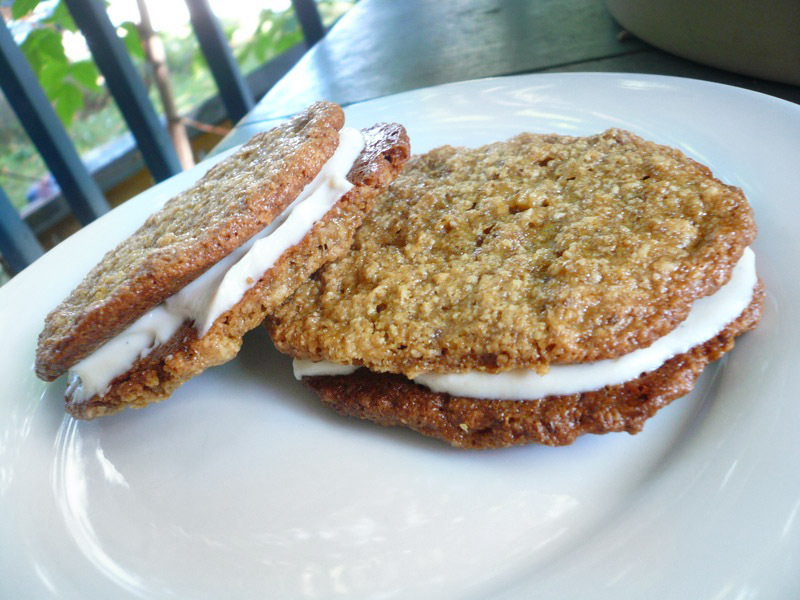 They’ve always been my most popular sweet treat among my friends, and now I’m happy to say that their awesomeness has been doubly affirmed by two recent cookie competitions! First, there was Lindsay’s 5th Annual Cookie Party in December, where my Half-Moons took the People’s Choice Award in what I was told was a landslide victory. Admittedly, this was just a small and informal gathering of friends, but still, the people voted and their voices were heard! And then there was this weekend’s 4th Totally Fabulous Vegan Bake-Off, where the Spectaculars won the Glorious Gluten-Free Treats (non-chocolate) category, where they were up against four other delectable gluten-free desserts. For those that don’t know, the Vegan Bake-Off is a wonderful event put on every year by the lovely Toronto Vegetarian Association and attended by hundreds of hungry vegans, who apparently loved my cookies, too. So hopefully you don’t need any more convincing: These cookies are good, and a sure-fire hit at your next cookie party. 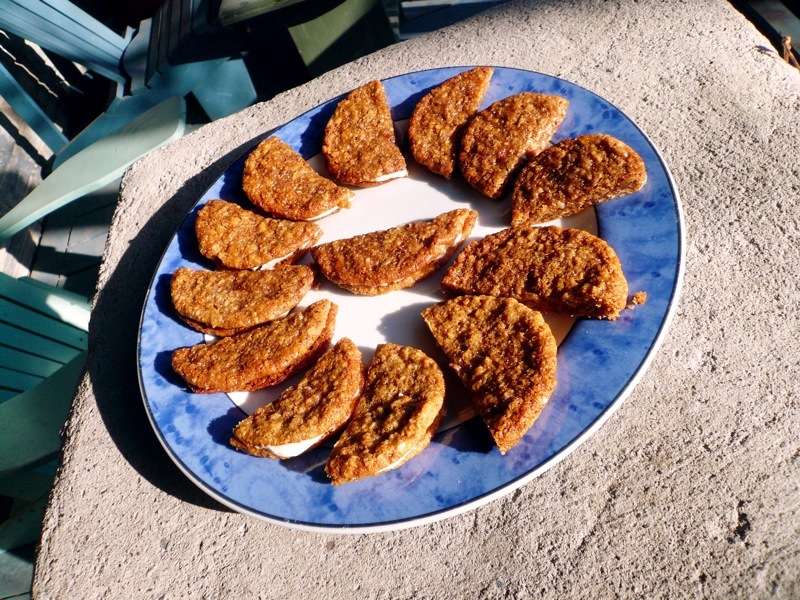 I’ve reposted the recipe below if you want to try them yourself, and you can always easily find it by clicking the link on my sidebar. Enjoy! If you wish, lightly process your oats: pulse just once or twice in a food processor—you want your oats to still be very coarse. 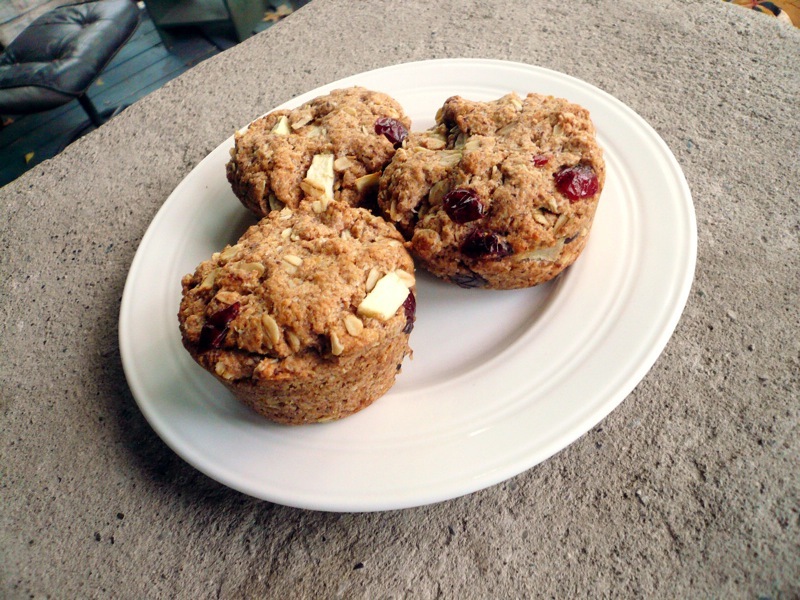 In a large bowl, mix together the dry ingredients: the oats, almond flour, baking soda, kosher salt, and cinnamon. If using Earth Balance: With an electric mixer or stand mixer, or simply in a blender (that’s what I do), beat the Earth Balance and oil until fluffy. Next, add the sugars and beat for 1-2 minutes until creamy. Finally, beat in the flax egg and vanilla extract. If using canola oil: In a medium bowl, mix together canola oil, sugars, flax egg, and vanilla, until well mixed. 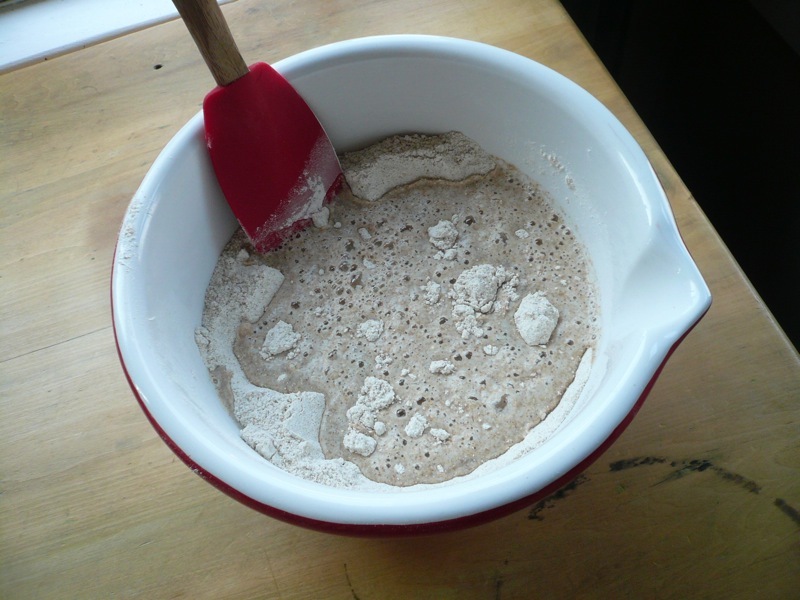 Add the wet mixture to the dry, and lightly stir together until a well-mixed batter forms. With a tablespoon, scoop out small spheres of batter and place on baking sheets. No need to flatten the spheres; however, the cookies will drop and spread out a lot while baking, so be sure to leave a lot of space in between each one. Bake for about 10-11 minutes, until they look done and slightly golden along edges. Allow to cool for 5 to 10 minutes and then transfer to a cooling rack for another 10 minutes. 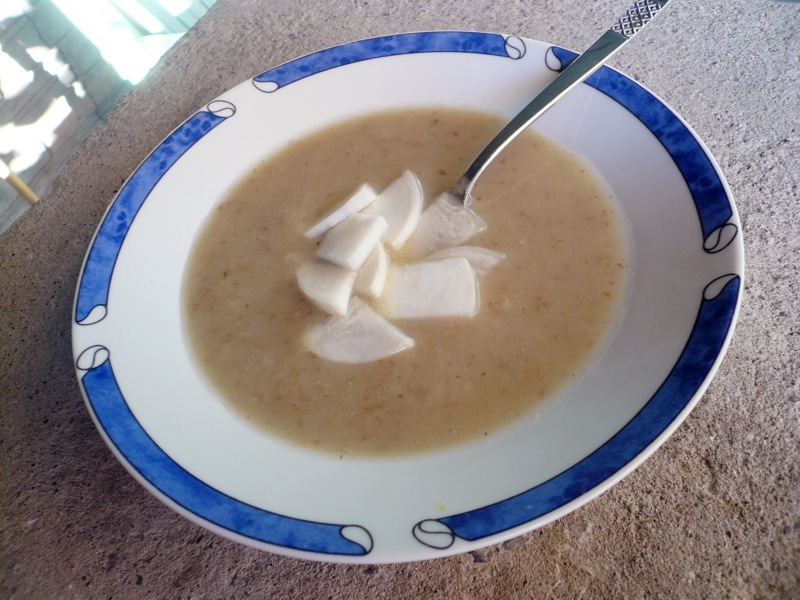 Because this recipe is from a book, I feel wrong posting it here, but since it’s so simple, I will tell you that this icing is just a mix of silken tofu, macadamia nut butter, maple butter, and a splash of vanilla: simply whirl all these together in a blender/food processor and adjust amounts to taste. If you don’t have maple butter, maple syrup will also work; and if you can’t find macadamia nut butter, you can sub in some other variety—I’d particularly recommend cashew butter. Additionally, if all this seems too vague of a recipe for you to attempt on your own, you can simply find and make some other vegan gluten-free icing (the internet can help you with that). However, I especially enjoy this icing because it’s not sugary sweet and full of healthy fat and protein. So maybe you should just buy Dreena’s book. Have you ever seen food on this blog and thought, “Maaan, I’d really like to pay someone a minimal amount of money to eat that”? Well now here’s your chance. For the last six months, I’ve been hard at work with an awesome group of dedicated students and volunteers helping to open a new campus café and restaurant we’re calling Harvest Noon and guess what—we’re opening Monday! 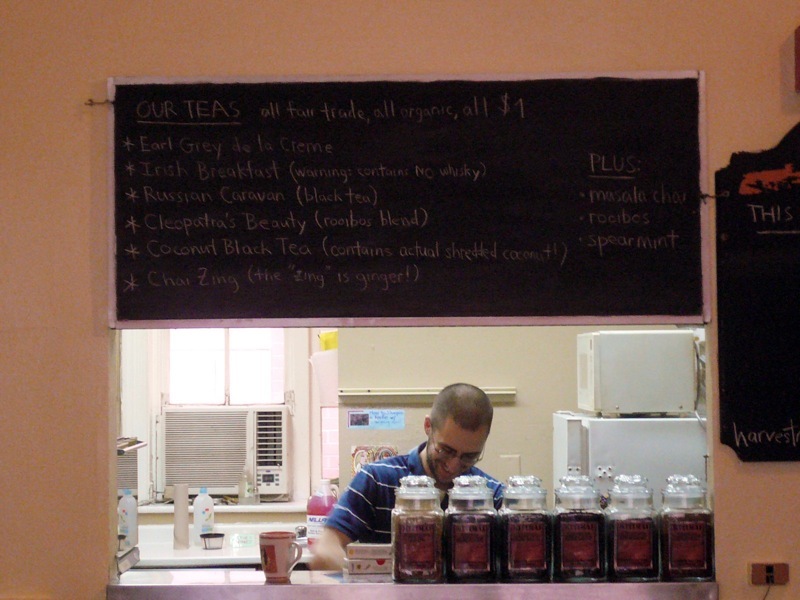 Starting January 30th, you’ll be able to visit us on the second floor of 16 Bancroft Avenue (the Graduate Students’ Union building, in the southwestern quadrant of the UofT campus) from 10am to 2pm Monday through Friday and grab an affordable and delicious UWEA-approved lunch, along with some coffee, tea, and a muffin. …and of course, my Foc Yeah! 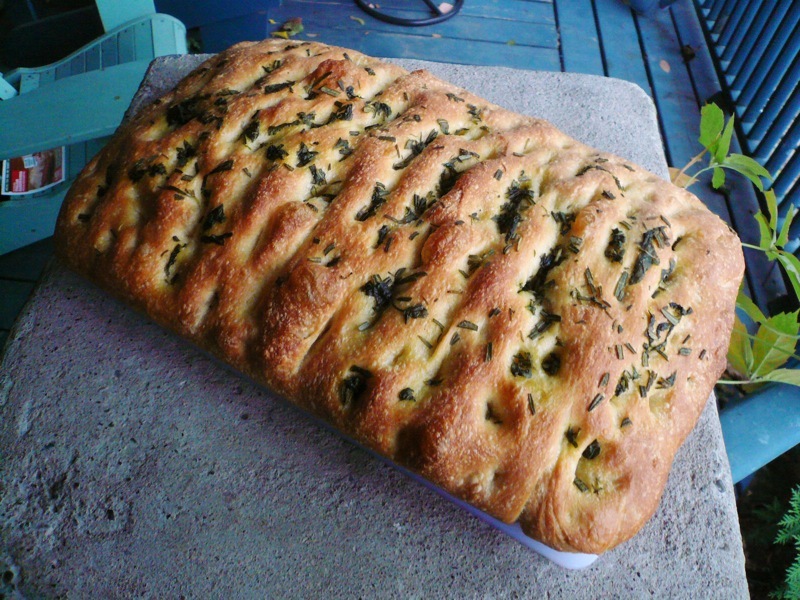 Focaccia Bread! 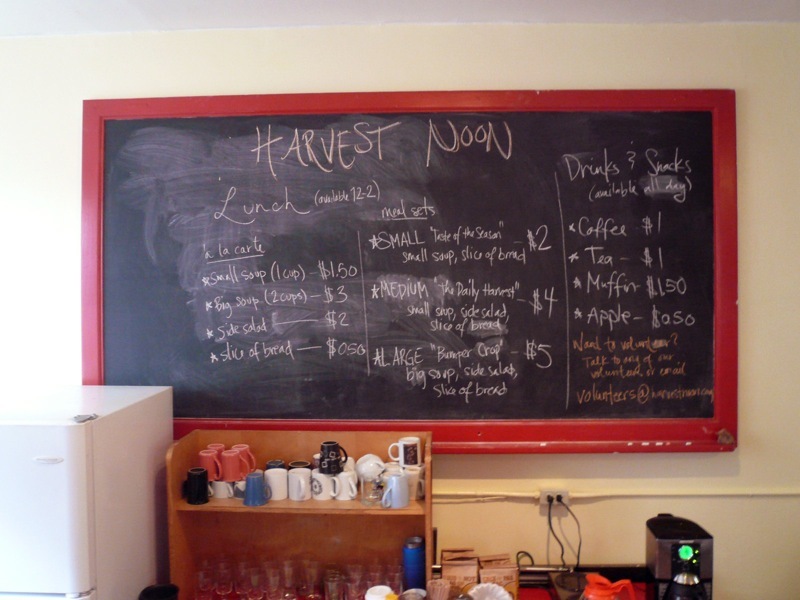 But Harvest Noon is more than just a super awesome restaurant which has given me the opportunity to share my food with the rest of the city. 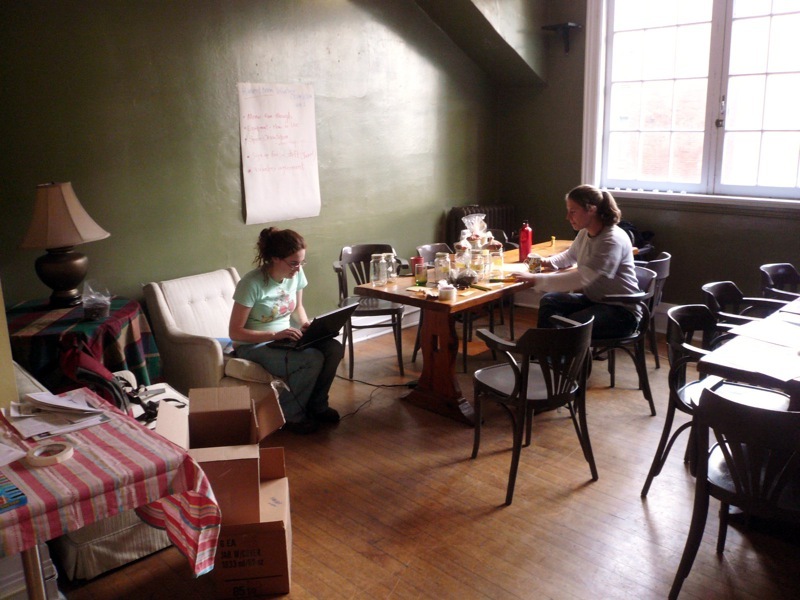 What really sets our café apart from the rest (and what got me involved in and excited about it in the first place) is our mission, mandate, and values: namely, our commitment to serving food that is locally, sustainably, and organically grown; maximally economically and dietarily accessible (that means cheap and vegan! ); and of course, healthy and delicious! So if you’re near the UofT campus next week, please stop by, say hi, and pick up some food! To repeat: 16 Bancroft Avenue, second floor, 10am to 2pm, Monday through Friday. And just in case you’re interested, let me remind you that Harvest Noon is currently opening 100% volunteer-run, and if you’re available and at all interested in helping us out, let us know by sending an email to volunteers@harvestnoon.com, and we’ll help find you a volunteer shift that works in your schedule! Okay, I know. I know I know I know. This blog has a sunchoke problem. But you see, sunchokes are just so good. And with only so many weeks left in their season, I can’t resist buying them each week at the farmers’ market and then coming home and challenging myself to find new ways to prepare them. This past week I got a little inspiration from the farmhand who sold me my sunchokes, who recommended I try roasting them with just a little bit of cinnamon. 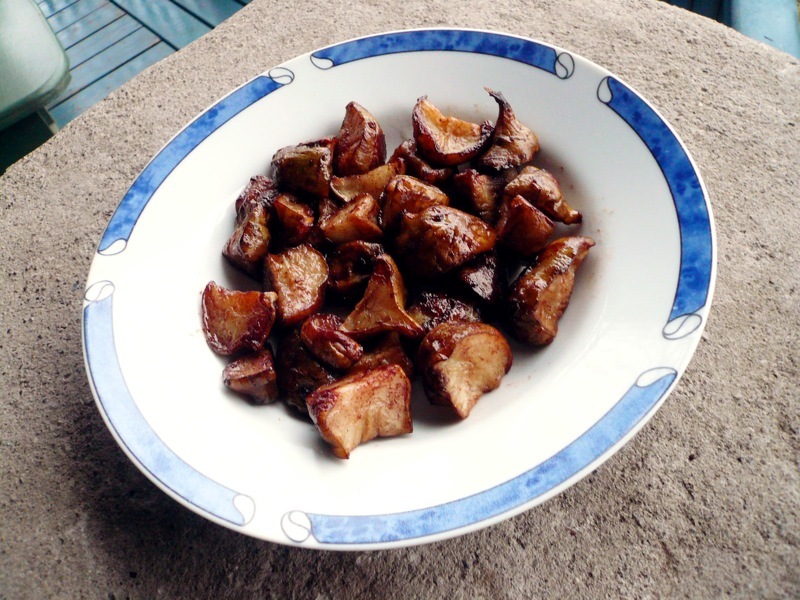 I hadn’t tried roasting sunchokes at all yet, so it seemed like a good thing to try. And boy howdy, did these taste good. 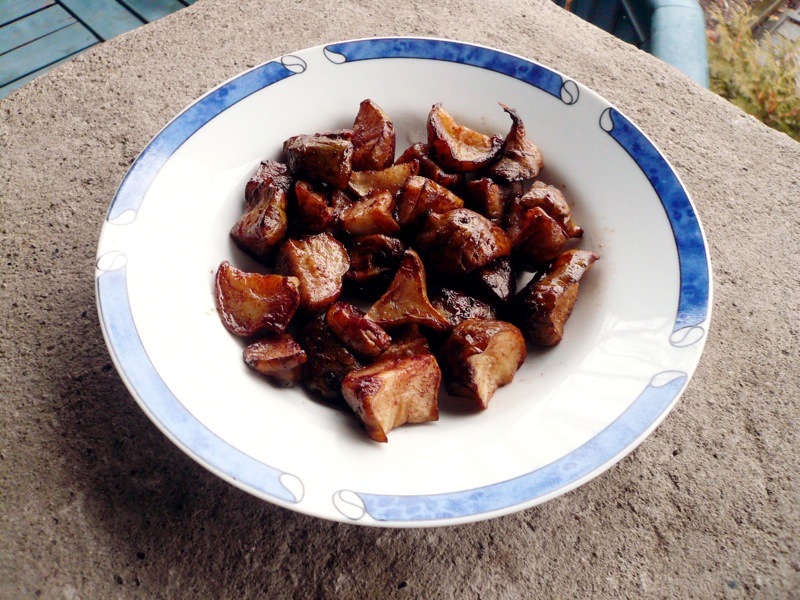 The recipe couldn’t be simpler: First, wash your sunchokes and then slice into big bite-size chunks. Next melt some coconut oil and then toss your sunchokes in that oil mixed with a teaspoon or two of cinnamon. Sprinkle a wee bit of salt on top of that, and then bake your sunchokes in the oven for about 45 minutes at 375°F, checking along the way for doneness. After they’re fork-tender, simply take out of the oven and enjoy! And that’s all there is to it! This is probably the easiest sunchoke recipe I’ve posted thus far, yet it’s one of the best, so I hope you find time to try it our for yourself. And rest assured, there will be more sunchoke recipes to follow—the season’s not quite over yet! Latte: Thor’s soy latte runs an expensive $4.53, and for that price I was expecting something a little better. That’s not to say this latte wasn’t good—it was—but at the same time, it wasn’t a latte I’d come back for. I was talking to the barista for a bit and he remarked on the difficulty of getting soy (as opposed to, say, almond milk) lattes to come out right, and maybe that’s true, but I’ve definitely tasted better soy lattes in this city than Thor’s. 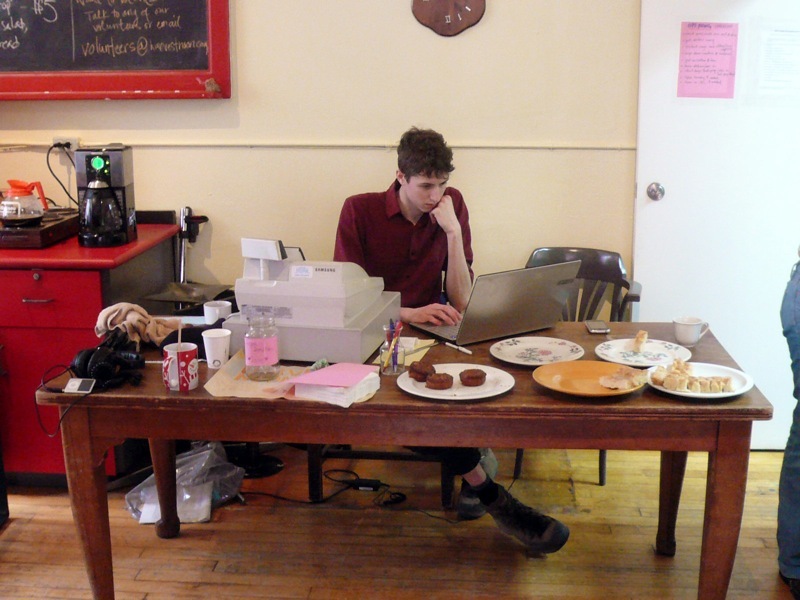 Atmosphere: This is no sit-down-do-work cafe. There are 9 seats in total, 3 of which are stools, and no tables whatsoever, unless you count the single bar. Granted, Thor is obviously not going for the sit-down aesthetic, aiming rather at something different; it’s just that that’s not the sort of café I generally am looking for. ￼Music: It started off with techno, and moved on to R&B (and not even The Weeknd, pfft). Definitely not my bag. Clientele: Most Thor customers were either coming in to grab a quick drink, or coming in to meet and chat with a friend. No one else was as foolish as I was to bring work in with them—again, the space really isn’t made for that. Food: Thor brings in some outside snacks and sweet treats, none of which are vegan. 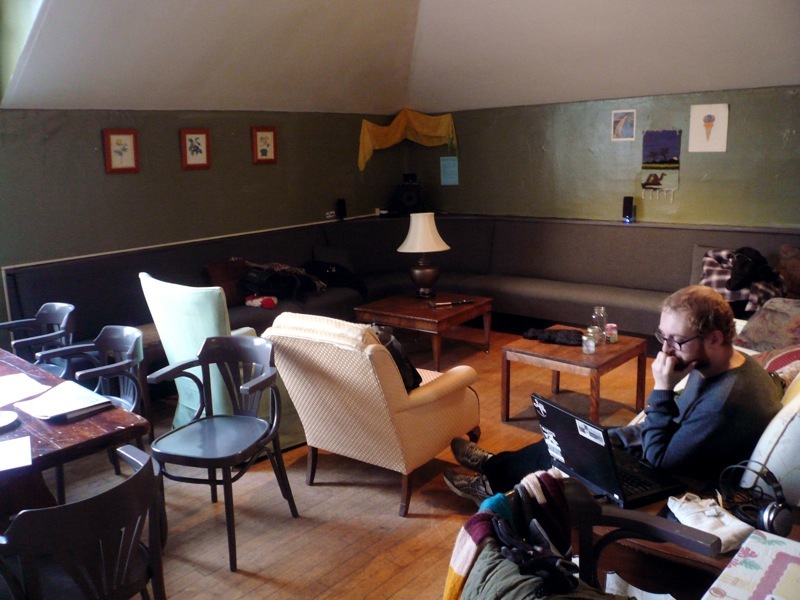 Final Verdict: With expensive drinks, crappy music, and a space not made for working, I don’t imagine that I’ll be coming back to Thor anytime soon—which is not to say it’s a bad café, but just not what I’m looking for.